Kavitha is a Registered Dietitian (RD) by the Commission on Dietetic Registration (CDR) which is the credentialing agency for the Academy of Nutrition and Dietetics and a Certified Diabetes Educator (CDE) by the National Certification Board of Diabetes Educators (NCBDE). She has over 16 years of experience serving adults and children in community health care and clinical settings. She has a Bachelor of Science degree in Food and Nutrition from Women’s Christian College, University of Madras – India. After which, she came to the United States to pursue her Master of Education in Nutrition Sciences from the University of Cincinnati in Cincinnati, Ohio for which she was awarded the University Graduate Scholarship and then did a one year Dietetic Internship at East Carolina University in Greenville, North Carolina. She also holds a Certificate of Training in Adult Weight Management through the Commission on Dietetic Registration. Kavitha is very passionate towards the care and education of patients with diabetes and chronic diseases. Her main interests are disease prevention and empowering patients with skills to take care of their diabetes and other health issues. 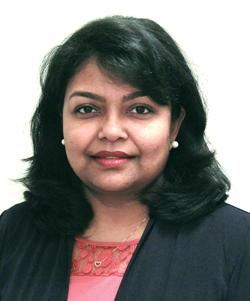 Prior to joining Endocrine and Diabetes Center, Kavitha worked as the Diabetes Program Coordinator at Sentara Northern Virginia Hospital in Woodbridge, Virginia and for almost 10 years as a Nutritionist at the Onslow County Health Department in Jacksonville, North Carolina. In her current position, she provides an array of services to patients with Type 1, Type 2, Gestational Diabetes, obesity and Metabolic disorders and also co-ordinates the AADE accredited diabetes education program at the Endocrine and Diabetes Center. She is a member of the American Association of Diabetes Educators (AADE). Kavitha is fluent in English and Tamil. When she is not teaching someone about diabetes or weight management, you will find her singing with her church choir or spending time with her husband and daughter and creating exotic Indian dishes for her family and friends.